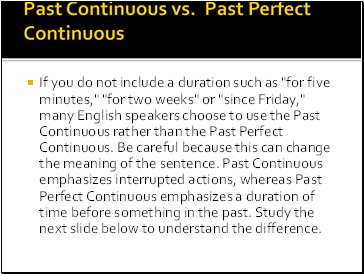 If you do not include a duration such as "for five minutes," "for two weeks" or "since Friday," many English speakers choose to use the Past Continuous rather than the Past Perfect Continuous. 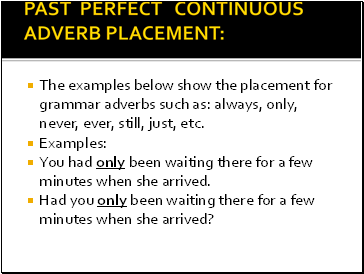 Be careful because this can change the meaning of the sentence. 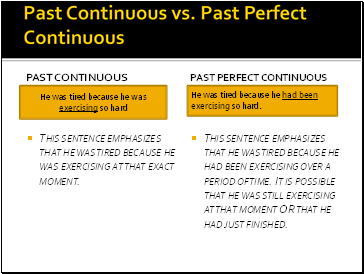 Past Continuous emphasizes interrupted actions, whereas Past Perfect Continuous emphasizes a duration of time before something in the past. 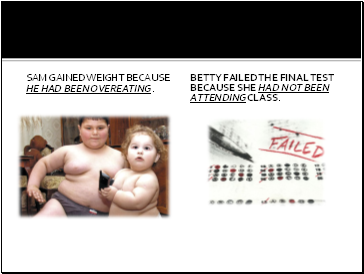 Study the next slide below to understand the difference. PAST PERFECT CONTINUOUS 1.They (shout) for a few hours before their parents arrived. 2.They (eat) noisily for a few hours before their parents arrived. 3. They (play) music at full volume for a few hours before their parents arrived. 4. They (jump )on their parents' bed for a few hours before their parents arrived. 5. They (try) on Mary's clothes for a few hours before their parents arrived. 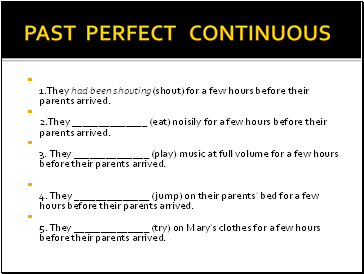 PAST PERFECT CONTINUOUS 1.They had been shouting(shout) for a few hours before their parents arrived. 2.They (eat) noisily for a few hours before their parents arrived. 3. They (play) music at full volume for a few hours before their parents arrived.